Nearly 50,000 years ago, the people of South Africa used milk- and ochre-based paints to adorn themselves, as well as stones and wooden slabs. The use of paint dates back 250,000 years, but most ancient paints were derived from plants and minerals. 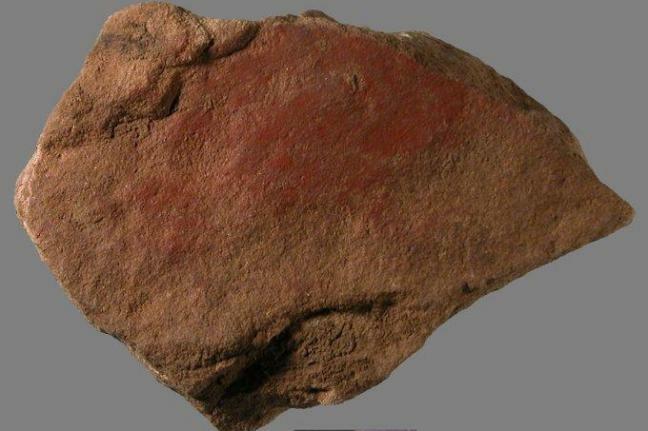 The latest evidence is the earliest example of milk-based ochre pigment in southern Africa. Ochre paints have been discovered in both ancient African villages of the Middle Ages and at concurrent European archaeological sites, but never before with milk used as the binding agent. While the use of ochre by early humans dates to at least 250,000 years ago in Europe and Africa, this is the first time a paint containing ochre and milk has ever been found in association with early humans in South Africa, said Paola Villa, a curator at the University of Colorado Museum of Natural History and lead study author. The milk likely was obtained by killing lactating members of the bovid family such as buffalo, eland, kudu and impala, she said. "Although the use of the paint still remains uncertain, this surprising find establishes the use of milk with ochre well before the introduction of domestic cattle in South Africa," said Villa. "Obtaining milk from a lactating wild bovid also suggests that the people may have attributed a special significance and value to that product." The powdered paint mixture was found on the edge of a small stone flake in a layer of Sibudu Cave, a rock shelter in northern KwaZulu-Natal, Africa, that was occupied by anatomically modern humans in the Middle Stone Age from roughly 77,000 years ago to about 38,000 years ago, said Villa. While ochre powder production and its use are documented in a number of Middle Stone Age South African sites, there has been no evidence of the use of milk as a chemical binding agent until this discovery, she said. A paper on the subject was published online June 30 in PLOS ONE. Co-authors were from the Italian Institute of Paleontology in Rome, Italy; the University of Geneva in Switzerland; the University of Pisa in Italy; the University of Monte St. Angelo in Naples, Italy; and the University of Oxford in England. The excavation was directed by Professor Lyn Wadley of the University of Witwatersrand, also a paper co-author. Cattle were not domesticated in South Africa until 1,000 to 2,000 years ago, said Villa. Wild South African bovids are known to separate from the herd when giving birth and usually attempt to hide their young, a behavior that may have made them easy prey for experienced Middle Stone Age hunters, she said. The dried paint compound is preserved on the stone flake that may have been used as a mixing implement to combine ochre and milk, or as an applicator, said Villa. The team used several high-tech chemical and elemental analyses to verify the presence of casein, the major protein of milk, on the flake. At both African and European archaeological sites, scientists have found evidence of ochre -- a natural pigment containing iron oxide than can range from yellow and orange to red and brown -- dating back 250,000 years. By 125,000 years ago, there is evidence ochre was being ground up to produce a paint powder in South Africa. It has been proposed the ochre was sometimes combined by ancient Africans with resin or plant gum to use as an adhesive for attaching shafts to stone tools or wooden bone handles, Villa said. It also may have been used to preserve hides and for body paint, she said, noting that a roughly 100,000-year-old ochre-rich compound blended with animal marrow fat was found at the Middle Stone Age site of Blombos Cave in South Africa. Body painting is widely practiced by the indigenous San people in South Africa, and is depicted in ancient rock art. While there are no ethnographic precedents for mixing ochre with milk as a body paint, the modern Himba people in Namibia mix ochre with butter as a coloring agent for skin, hair and leather clothing.